Officials in Stueben County New York are preemptively working on an agreement with Marcellus Shale drilling companies. 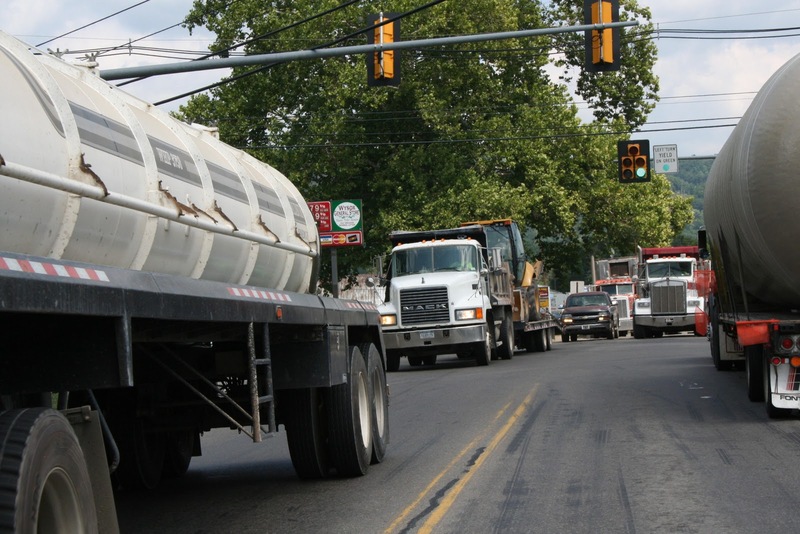 Heavy truck traffic in Towanda PA as a result of Marcellus Shale natural gas fracking. In the event drilling and fracking begin in New York State, a road-use agreement is being put in place that would ensure road infrastructure repair costs do not fall to the taxpayer. In June the temporary state-wide drilling moratorium could end. If it does, expectations of heavy truck traffic from slickwater hydraulic fracturing development would break down county roads. “The agreement now calls for drilling companies to pledge between $150,000 per mile and $300,000 per mile for to repair county roads damaged by construction or haulage during future drilling of the Marcellus Shale in Steuben. • Drilling companies must notify the county of their routes. • Once the routes are approved, the roads will be surveyed at the driller’s expense. • Based on the survey, bonds will be determined and in place before the companies use the roads. • The roads must stay in good condition during use by the gas firms. • Once the heavy traffic ends, the roads will be analyzed again at the driller’s expense, and restored to their original condition. • Gravel roads are included in the draft and rated for use in town agreements.